So you have hikes on the schedule during your Hawaii vacation! What are the best shoes to wear hiking in Hawaii? It’s good that you’re asking this question because your footwear is very important when your walking mileage starts to creep up. And your footwear may be the most important thing to consider for what to wear hiking in Hawaii. Good shoes, and shoes appropriate for the conditions you’ll be walking or hiking, can be among the best things to ensure a fun and comfortable hike! There may be exceptions to this, such as paved trails or hiking trails with more difficult terrain. But these types of shoes can likely work for most of the popular hiking trails in Hawaii. Do you really need hiking shoes for Hawaii?! Can you wear the gym shoes or tennis shoes you already have when you go hiking in Hawaii? 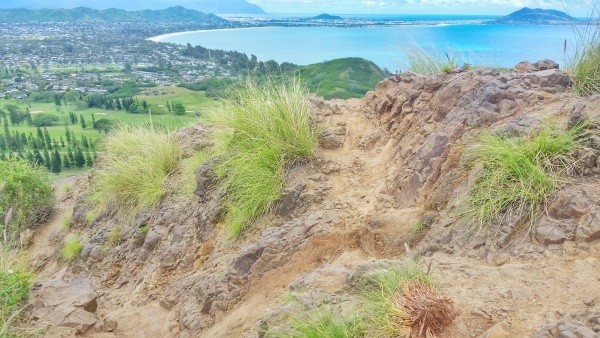 For Hawaii’s popular hiking trails among visitors, you will likely get by just fine wearing the gym shoes, walking shoes, or running shoes you wear on a regular basis. This is especially true for the paved hiking trails in Hawaii. 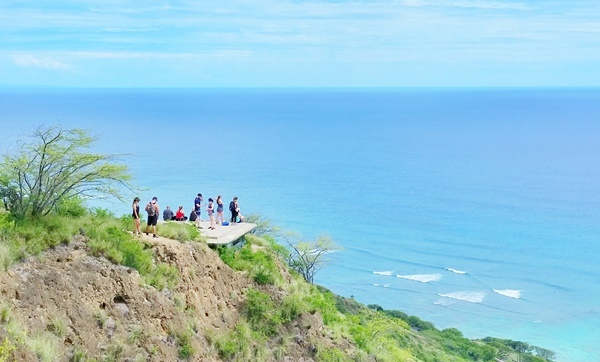 And on many of the popular hiking trails, in particular the Diamond Head Hike, you will see people wearing all types of shoes. And that includes flip flops. But that doesn’t mean flip flops are the best choice for hiking! On some trails, flip flops can be a BAD idea! You may even see locals hiking barefoot on some trails. What’s the difference between your regular walking shoes and hiking shoes? Even though you can manage just fine in your regular shoes, there may be reasons you’ll want to use Hawaii vacation as an excuse to invest in new shoes. The main reason you may consider wearing shoes designed for trails is because these types of shoes will provide you with more traction than your regular shoes. Another reason to have trail shoes is for the support they can give you on trails that have rough surfaces and aren’t particularly flat. That extra traction can be helpful in Hawaii, and so can that help with support on varied terrain. 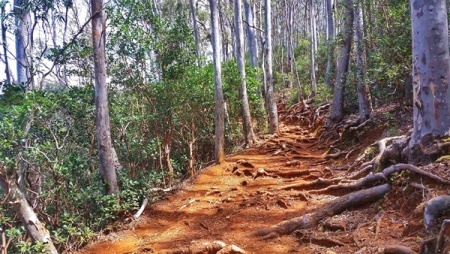 Many of Hawaii’s popular hiking trails have lots of stretches of dry dirt and loose gravel. This can make for conditions that may cause you to slip a little and slightly lose your balance. There are other hiking trails that may have you basically climbing up steep inclines or boulders with dry dirt and loose gravel… which can lead to a little bit of slipping. It can be easy to slip on the dry and loose dirt, and if you’re on a popular trail that has that kind of terrain, you may even hear someone lose their footing behind you. 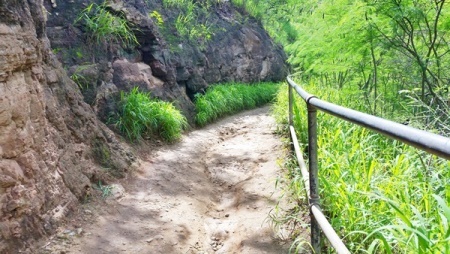 Hawaii’s hiking trails are also filled with variable terrain. It’s part of what can make hiking in Hawaii fun! 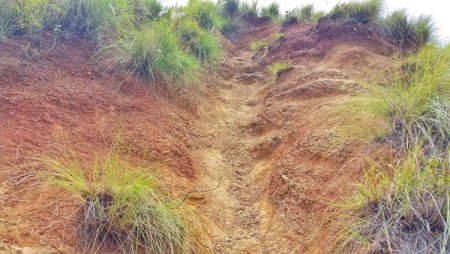 Many trails also have roots popping up. Now, this isn’t to the point where you would consider these popular hiking trails dangerous. Because most of the time, people will likely be able to catch themselves if they do start to slip. So they don’t fall completely. Although it does happen that people fall to the ground. These types of hiking sandals are a popular choice for hot weather hiking because they can be more breathable than shoes. At the same time, they still provide that extra level of traction compared to regular shoes. You can find sandals that give you that extra grip that you won’t find in regular sandals too. They can also be more ideal if you’ll be doing hikes that require small stream crossings, since it won’t be as big of a deal if they get wet. Most importantly, hiking sandals are also designed so that they will be comfortable on longer hikes. Hiking sandals can be easier to pack in your suitcase since they are lighter than closed-toed shoes and take up less space. One of the down sides though is that they can dirty up your feet quickly, depending on the trail. Although, you can find some more closed-toed type hiking sandals too that can minimize the amount of dirt you get on your feet. Similar to hiking sandals, hiking shoes like these will give you the extra traction and support on varied terrain compared to regular shoes. Shoes will give you a little bit more ankle support than sandals. They will keep your feet cleaner, and you may find that you like the stability that shoes provide better than sandals. Wearing shoes can also be better if you happen to ram your foot into a rock or tree roots, as the stubbed toe won’t hurt as much when you have the protection of shoes. Merrell hiking shoes are a popular brand for hiking shoes. Compared to hiking shoes, trail running shoes like these tend to be slightly more lightweight. As you can guess, trail running shoes are primarily made with runners in mind. This can be another reason why the best trail running shoes will have a balance of being light (relatively speaking!) and having the traction to run on dirt, rocks, and tree roots. They can be a good alternative for hiking even if you have no plans to use them for running. Trail running shoes are generally stiffer in the sole to account for the trail conditions, so keep that in mind too if you’ve never worn them before. Salomon running shoes are a popular brand for trail running, and they have a decent selection of colors too, compared to hiking shoes! For serious hikers who are embarking upon longer trails with variable terrain, you also have the option of wearing hiking boots like these. These are more heavy duty than the other types of trail-ready shoes which makes them heavier too. They do give more ankle support than traditional shoes, or even hiking shoes, so they could be a good option if you’re looking for that. You might think about wearing hiking boots instead of shoes if you’re doing a longer trail like the full Kalalau Trail on Kauai’s Napali coast. But if day hikes are more of your thing, you can do the first couple of miles of the trail without a permit too for the breathtaking views! If you are sticking to some of the popular short hiking trails in Hawaii, you may like the other lighter weight shoes for hiking. 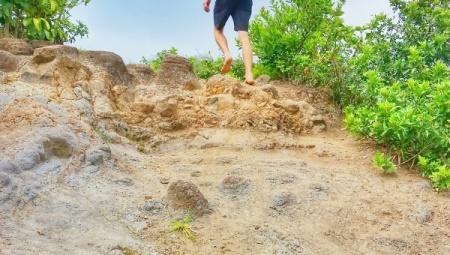 If you’re only planning on doing paved hikes in Hawaii, or you’re just looking for comfortable shoes for walking around the main streets, you may not necessarily need the traction that hiking shoes give you. In that case, you may look to wearing regular walking shoes like these. There are also flip flops that are designed to be more comfortable for a good amount of walking with flip flops like these. If you do decide to buy new shoes to wear before your Hawaii vacation, make sure that you go for more than a few walks in them. You want to make sure to break them in before you go to Hawaii. It would be the worst if you discover in Hawaii that they aren’t comfortable shoes at all!